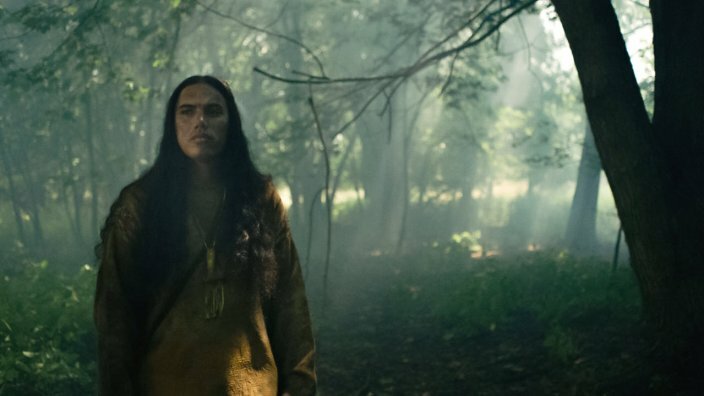 Notions of good vs evil, Native American portrayal and, god help us, Adam Sandler... tracking the evolution of the Western. Tom Mix and Mrs Mix mixed things up. The original iconic cowboy, Tom Mix, set the tropes and tone for on-screen Westerns early, wearing his enormous white hat as he took the fight to black-hatted baddies in silent film stories of good versus evil on the frontier. In the pre-WWII era, morality was a simplistic equation – if you had a moustache, you were getting shot, and if you were the good guy, you were getting the girl and a sunset-riding ending. When we got talkies, the prototypical Western was Stagecoach, which featured all the things audiences of the '30s wanted – John Ford behind the camera, John Wayne in front of it, dangerous Apaches, Monument Valley backdrops and, of course, a stagecoach. By the time the 1950s rolled around, there was a new enemy on everyone’s mind – and that enemy was defined by a collectivism that seemed diametrically opposed to the individualism that made Western heroes great. And so we see the one man who’ll stand up to bullies – Gary Cooper in High Noon, song-singing sheep-herder Errol Flynn in Montana, two-fisted blow-in Alan Ladd in Shane – taking down bullies one punch at a time. On the small screen, Westerns flourished, with episodes of Gunsmoke, Bonanza, Maverick and Wagon Train delighting kids and adults alike. Clint Eastwood in 'A Fistful of Dollars'. When they weren’t remaking Japanese films with a more Mexican-border bent, 1960s filmmakers were adding shades of grey to their protagonists. The suspiciously Italian-looking landscapes of Spaghetti Westerns introduced Clint Eastwood’s squinting, laconic Man With No Name, who hunted for bounties rather than an innate sense of justice. Even John Wayne was blotting his copybook with a shooting of Liberty Valance that wasn’t what it seemed at one end of the decade and a visible weariness at the other end in True Grit. 'Blazing Saddles' deconstructed the Western myth. 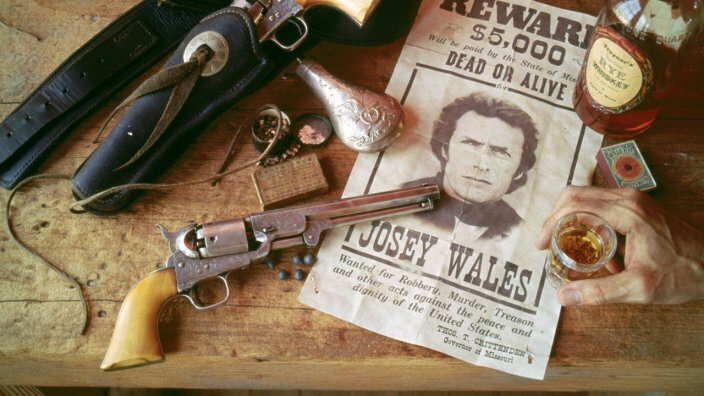 While there was no shortage of serious Westerns in the 1970s – The Outlaw Josey Wales, The Shootist, A Man Called Horse – the genre came up against changing social attitudes. Butch Cassidy and the Sundance Kid took the tropes of the Western to create a buddy comedy that was made in 1969, but nevertheless reflected the more knowing, wink-to-the-audience tone of the coming era. The more left-field Blazing Saddles and Westworld both skewered the idea of lionising the 19th-century frontier, using satire and sci-fi respectively to talk about racism, humanity and identity. 'Back to the Future III' railed against duded-up, egg-sucking gutter trash. Back to the Future III (which was shot back-to-back with the second film in the series in 1989, but not released until 1990) demonstrates how people viewed Westerns in the 1980s. A generation of kids who played Cowboys & Indians grew up to become filmmakers, and wanted the chance to recreate those tales they loved from childhood – even in comedic form (see also: The Three Amigos). 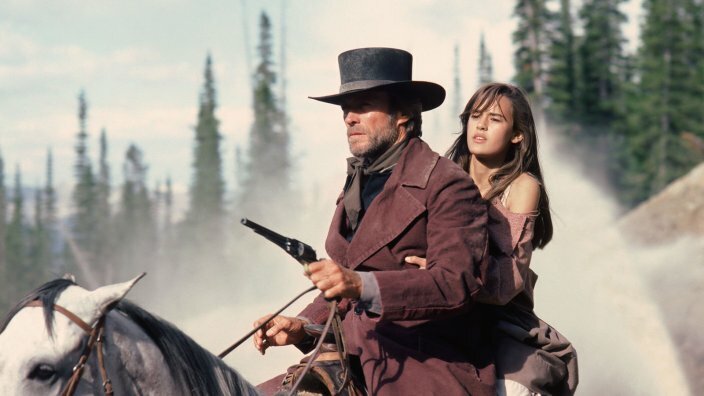 Comedy aside, Pale Rider stands firm as a decade highlight, bringing a supernatural edge to a classic revenge plotline. And, of course, we can’t let the ‘80s become the ‘90s without a nod to the kitschy fun of Young Guns and its Brat Packer-filled cast: Charlie Sheen, Emilio Estevez, Kiefer Sutherland and Lou Diamond Phillips as baby-faced gunslingers. An attempt at realistic Sioux dress and customs in 'Dances with Wolves'. When revisionist deconstruction Unforgiven won the Academy Award for Best Picture in 1992, it stood as a symbol for the entire decade’s serious reevaluation of Westerns as a genre, and was quickly followed by knock-offs like Tombstone and Wyatt Earp. Before them all, Dances With Wolves was one of the first high-profile attempts to portray the customs and lifestyle of Native Americans accurately, albeit through the lens of a white outsider. Mid-decade, The Quick and the Dead, Dr Quinn, Medicine Woman and Bad Girls put female protagonists at the heart of a traditionally masculine genre (Calamity Jane and Annie Get Your Gun notwithstanding). Even Toy Story took the opportunity to comment on how the Space Race had replaced Westerns in the hearts and minds of the American public. Al Swearengen was an instantly iconic villain. From 2005, Deadwood reminded everyone that they loved Westerns unironically, but went further than the traditional iconography to muse on the birth of post-Civil War America and move from chaos to order that defines all communities. The renaissance wasn’t limited to television, though. No Country for Old Men updated the tropes in a modern setting, while The Assassination of Jesse James By the Coward Robert Ford and The Proposition proved there were still stories to be mined from a traditional Western tale. 'The Hateful Eight' is another Tarantino love-letter to the genre. In some instances, we have reverted to nostalgia/pastiche with remakes of True Grit, The Magnificent Seven and Westworld, plus Quentin Tarantino’s homages, Django Unchained and The Hateful Eight. But there are some bright spots for those of us looking for original stories in the genre. Frontier uses Jason Momoa to great effect as a conflicted fur trapper, Klondike revisited the northern Gold Rush and Adam Sandler’s The Ridiculous Six... umm... never mind. Saddle up for a filmic feast of gun-slinging greats. Who were the original cowboys? And what exactly did they do?